ONG CHOON MOY, an ordinary housewife, stays at home taking care of her two children. Her husband works hard to earn money to support his family. Although they are poor, they live a happy life. ONG CHOON MOY has been suffered from cough and stomachache since 2014. In the early stage, ONG CHOON MOY just took it as common stomach illness. However, the unbearable pain urged her to hospital to take further examination. Unfortunately, she was diagnosed with lung cancer. Just like most cancer patients, it was hard for ONG CHOON MOY to accept the fact that she got lung cancer. This news was like a thunderbolt out of a clear sky. She did not cry, because she knew that it wouldn’t help, but only made her feel worse. She took chemotherapy and radiotherapy in a local hospital of Malaysia. The side effects brought by chemotherapy and radiotherapy, such as pain, vomiting, hair losing, made her suffer a lot. She felt even worse when knowing that her condition did not turn better after taking dozen times of chemotherapy and radiotherapy, her tumor just shrank 1%. At that time, she run out of all her savings. ONG CHOON MOY mentioned that fighting against cancer is so difficult that she almost give up. After witnessing the death of her friend who got cancer but gave up treatment, she told herself that under no circumstance can she give up, she must fight to the last moment. Her little son is only 13 years old and just enters junior school, she wants to restore to health and witness the growth of her son. She searched on the internet, aiming to find a better lung cancer treatment. Fortunately, she found Modern Cancer Hospital Guangzhou. At that time, a series of symposiums about cancer treatment were held by Modern Cancer Hospital Guangzhou in Malaysia. She decided to participate in the symposium held in Malacca. After the symposium, Professor Peng Xiaochi, the chief oncologist of Modern Cancer Hospital Guangzhou, gave her some therapeutic recommendations. However, considering about her economic condition and other reasons, ONG CHOON MOY did not came to China for treatment immediately. Several months later, with the help of strangers in Malaysia, ONG CHOON MOY gained enough money. Actually, except for her husband, both her mother and sister disagreed with her decision about taking cancer treatment in China, because they worried about ONG CHOON MOY’s condition and knew little about Chinese medical technology. However, ONG CHOON MOY and her husband insisted on taking lung cancer treatment in Modern Cancer Hospital Guangzhou. Finally, ONG CHOON MOY started her journey of taking cancer treatment abroad. ONG CHOON MOY’s lung tumor has developed into the fourth stage when she hospitalized. The Multidisciplinary Team (MDT) of Modern Cancer Hospital Guangzhou quickly made her an individualized therapeutic plan: interventional therapy and cryotherapy. After taking interventional therapy and cryotherapy in Modern Cancer Hospital Guangzhou, her tumor shrank and the pain used to torture her greatly also disappeared. Wang Zenghai, ONG CHOON MOY’s attending doctor, told us that the CT result showed that ONG CHOON MOY’s lung cancer cells and those cancer cells metastasizes to the pleura reduced greatly. Her condition now turns better. 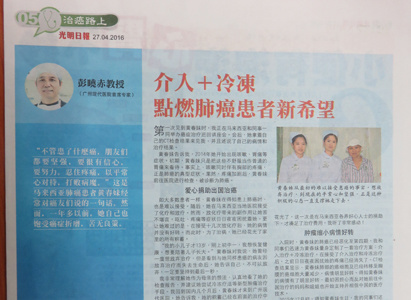 Knowing that ONG CHOON MOY’s conditions become much better, her sister and mother started to support and believe the medical technology in China. ONG CHOON MOY mentioned that the medical technology in China is advanced than that in Malaysia. In Malaysia, there are only traditional treatments for lung cancer, such as chemotherapy, radiotherapy, etc. There is no cryotherapy, chemotherapy and other minimally invasive therapies in Malaysia. What’s more, the services in Modern Cancer Hospital Guangzhou are humanized; doctors and nurses here are friendly and nice. On ONG CHOON MOY’s birthday, doctors and nurses of Modern Cancer Hospital Guangzhou specially prepared ONG CHOON MOY a birthday cake for celebration. Although ONG CHOON MOY did not use to celebrate birthday, the considerate service of doctors and nurses made her happy and moved. One year pasts, ONG CHOON MOY’s mentality changed a lot. At the beginning, it was hard for her to accept the fact; she even wanted to give up, but now she becomes optimistic and strong. It is her optimistic and strong mind that helps her fights against cancer bravely.